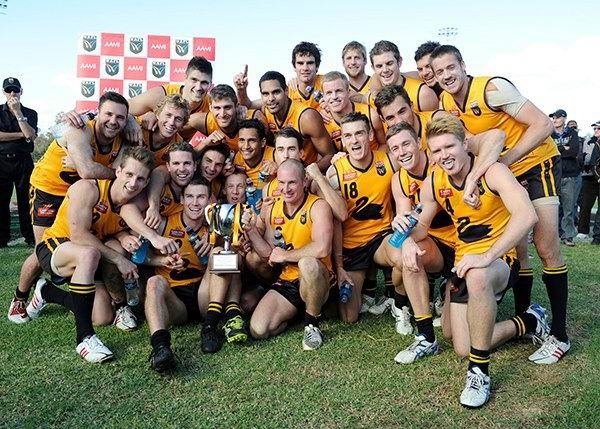 WA players celebrate their first win over Victoria in 22 years. As the youngest player in WA’s thrilling 17.16 (118) to 15.11 (101) triumph over Victoria, Black racked up 22 touches to be among the side’s best in Northam on Saturday. The 20-year-old midfielder slotted two majors as one of just five multiple goal kickers. WA had not beaten Victoria in 22 years. Black admitted the intensity of the match was daunting, but a confidence-boosting early goal helped him settle into the pace. ‘I didn’t expect to go out there and kick two goals and have the impact I did,’ he said. His Falcons teammates Andrew Strijk and Jay van Berlo were also solid contributors. Strijk had 20 possessions, while van Berlo (13 possessions, one goal) laid five tackles ” second only to East Perth’s Craig Wulff who landed six. Swan Districts’ Wayde Twomey, a former Carlton player, kicked five goals to win the Simpson Medal as WA’s best.